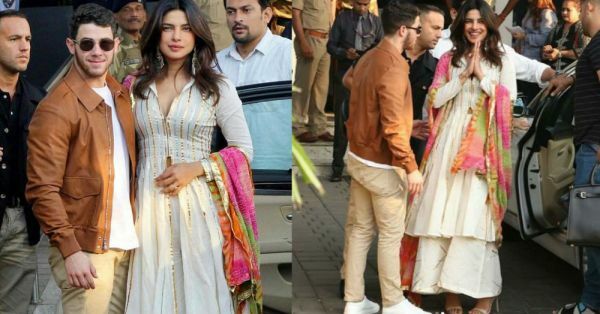 Priyanka Says Goodbye To Singledom Dressed Like *The Desi Girl* She Is! OMG! Only 3 days left for our 'desi girl' to go from being PeeCee to PeeCeeJay. Our homegirl, Priyanka Chopra is all set to wed American pop star Nick Jonas, which will bring their fairytale romance to the 'happy ending' it deserves. With the arrival of the Jonas family in Mumbai, the Nickyanka pre-wedding party and pooja, it's started to sink in. It. Is. Happening. 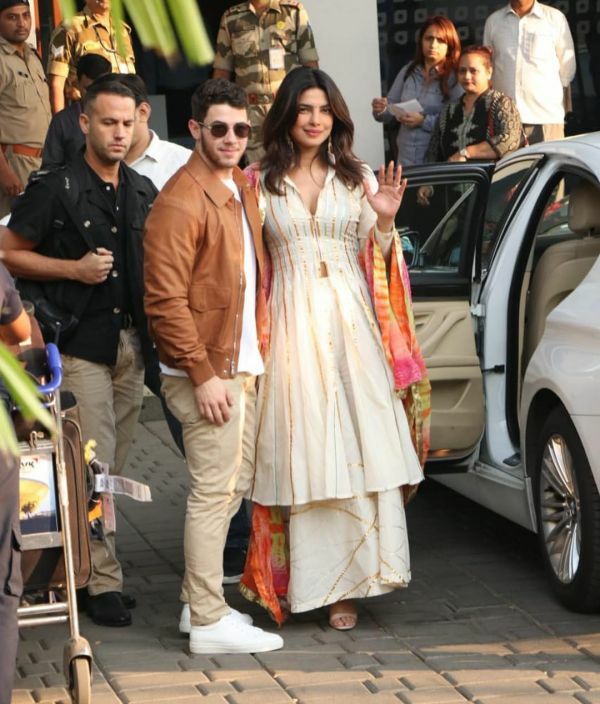 This morning kicked it in even further - we spotted Priyanka and Nick at the airport, ready to take off to Jodhpur for their big fat Punjabi wedding. And might we add, PeeCee looked like a snack... a delicious, desi snack, that is. The not-so-single actress chose a chic Indian ensemble from Gulabo by Abu Jani Sandeep Khosla. Of course, Priyanka was glowing from within but the kurta-palazzo outfit made her shine even brighter. 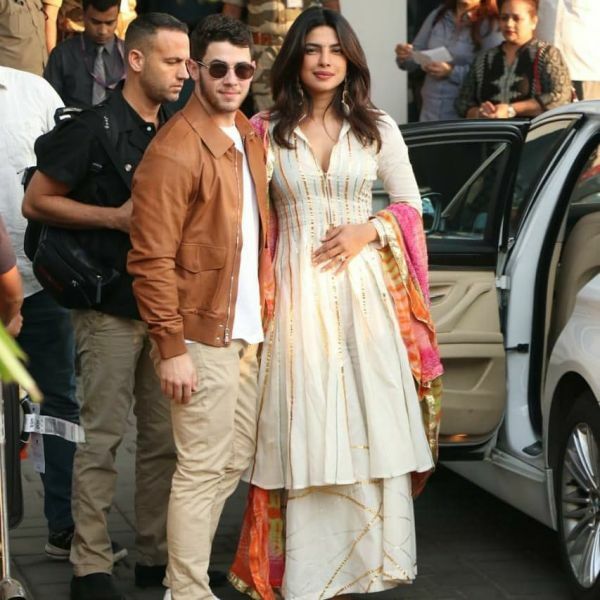 Wearing a fit and flare jacket-Anarkali that concealed the bust area with only a zipper, PeeCee turned up the heat, just like she's always done. The well-fitted kurta had a plunging neckline and a slit cut up to her waist... but what we're drooling over is AJSK's signature gota-patti work decorating the length of it. You can see the multi-coloured metallic work on her wide-legged palazzos as well. Nothing like a pinch of gota to add glamour to a day-look, is there? Our favourite part about the bride-to-be's airport outfit, though? Hands down, her Rajasthani-style Leheriya dupatta! The charming combination of rainbow shades against the ivory backdrop of Priyanka Chopra's kurta was nothing short of sensational. PeeCee finished her look with a tiny bindi on her forehead and ethnic drop chandbali earrings by TBZ. Now, that's how you welcome your wifey days to come, isn't it? There's going to be more where this came from so don't you disappear! We're going to update all the goings-on at the wedding venue, i.e. Umaid Bhavan but until then read all about the Nick-Yanka affair here.